Mold Testing FAQ - MJB Services Inc.
What’s the Difference Between a Mold Test and a Mold Inspection? These terms are often used interchangeably, but they mean different things. Both are necessary parts of the process that determines whether you have a mold problem. 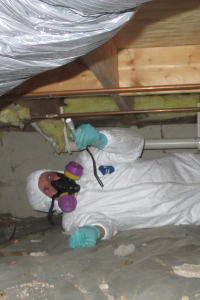 A Mold Inspection is the process of looking for sources of moisture that can cause mold growth. A Mold Test is collecting samples of anything thought to be mold that’s discovered during the Mold Inspection. If any samples are collected, they are sent to a trusted laboratory for analysis. Analysis determines if the samples collected really do contain mold, and what types and amounts of mold are present. What Different Types of Mold Tests Are There? Surface Mold Tests take samples from walls and ceilings, but also from objects like clothing or furniture. Air Quality Tests collects samples from the air to determine the types and amounts of mold you may be breathing. We’re experts at both types of Mold Testing! Delivering your test results is part of our normal Follow-up Procedure. But knowing whether you have a mold problem is only the beginning. In order to know the best way to respond, you need to really understand what your test results mean. This is the most important part of the whole process. Our job isn’t done until we’re sure that you understand your test results! Some molds can produce toxic substances! If you see mold – especially black mold – or if you notice a musty or moldy smell, anything that makes you suspect that you have a mold problem, don’t wait! The problem won’t get better by itself!